A rescue team searching through the wreckage of TransAsia Flight 235. Beijing and Taipei’s responses to a fatal plane crash in Taiwan reveal the complexities of their relationship. 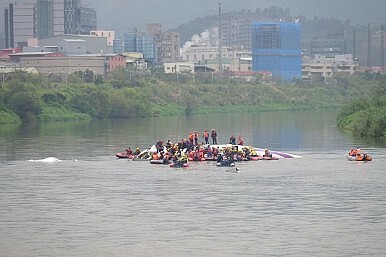 On February 4, a TransAsia airways flight crashed into the Keelung River in Taipei City. The plane, Flight 235 from Taipei to Kinmen, was carrying 53 passengers and five crew members; as of today, 31 have been confirmed dead, with 15 injured and 12 still missing. The plane suffered engine failure, according to a message from the pilot to air traffic control shortly before the crash. Rescue efforts – and an investigation into the cause of the crash – are complicated by the unique political constraints of the cross-strait relationship. The TransAsia plane was carrying 31 tourists from mainland China, meaning the crash necessitates a response from Beijing. But beyond that, the Chinese Communist Party insists that it has ultimate authority over Taiwan, and its response to the TransAsia tragedy reflects this. In the wake of the crash, Xinhua ran a story describing President Xi Jinping’s “important orders” for dealing with the disaster. “Chinese President Xi Jinping has ordered obtaining accurate information on the TransAsia Airways … [Xi] also ordered caring for the relatives of passengers and properly manag[ing] other matters,” Xinhua reported. The story perpetuates the idea that Xi, as the top leader in Beijing, can issue orders to the government on Taiwan. Chinese media outlets use similar language when Xi responds to tragedies within mainland China, with orders given to investigate the cause and care swiftly for the victims. In addition to Xi’s comments, the Civil Aviation Administration of China (CAAC) offered its “all-out assistance to TransAsia Airways” – apparently ignoring the fact that Taiwan has its own Civil Aeronautics Administration. The CAA has already banned TransAsia from receiving international air traffic rights – effectively extending an existing ban laid down after another TransAsia plane crash last July. China also said it would send officials from the Taiwan Affairs Office of the CCP Central Committee to help handle the aftermath. The response from the TAO was more reflective of the realities of Taiwan’s governance. A spokesman indicated that TAO had received information on the accident from Taiwan’s Mainland Affairs Council and the Strait Exchange Foundation. The spokesman also expressed China’s “hope” that “the Taiwan side” will continue to put the utmost effort into recovery efforts. Beijing’s response has sparked some concern in Taiwan, which is always sensitive to perceptions that the mainland government is unduly interfering in island affairs. Taiwan’s Mainland Affairs Council had to clarify that Beijing has a right to participate in the investigation given that its citizens were on board the flight. MAC deputy chief Wu Mei-hung pointed to the example of a 2010 plane crash in Taiwan where Australian experts joined the investigation. A spokesman from Taiwan’s Executive Yuan agreed that it was proper to have Beijing send experts to join the investigation, but also said the government would ask the MAC “to pay extra attention to the issue of jurisdiction to prevent it being overstepped,” Taipei Times reported.